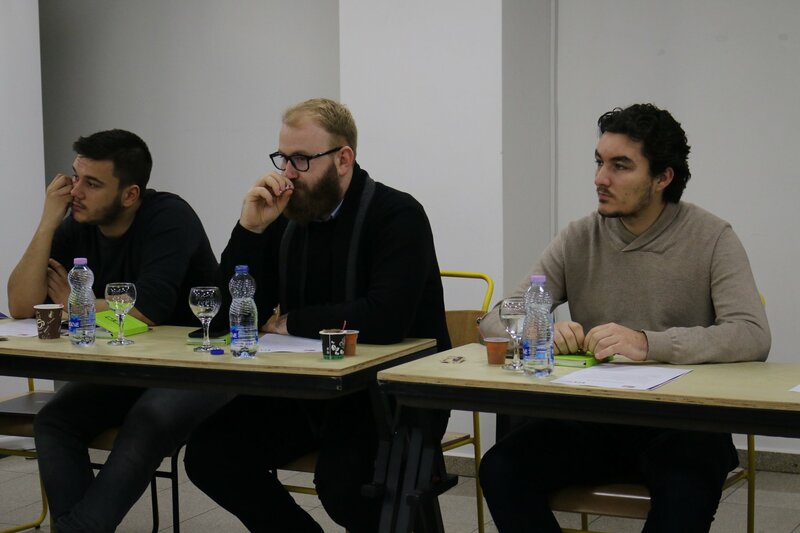 A meeting of highly regarded ICT and miscellaneous professionals in thanks to the U.S. Embassy and Innovation Centre of Kosovo, rounded together to discuss a project aimed at the youth, all with the power of geeks. Two dangerous things happened that day: 1. Nerds of all corners rallied together to unite their forces which is always an unmatched tempest in the sea of change and 2. Those forces have plotted to take us all to the next level. A level unlike one we’ve ever dealt with in our country. Nobody is safe to remain ignorant for long. 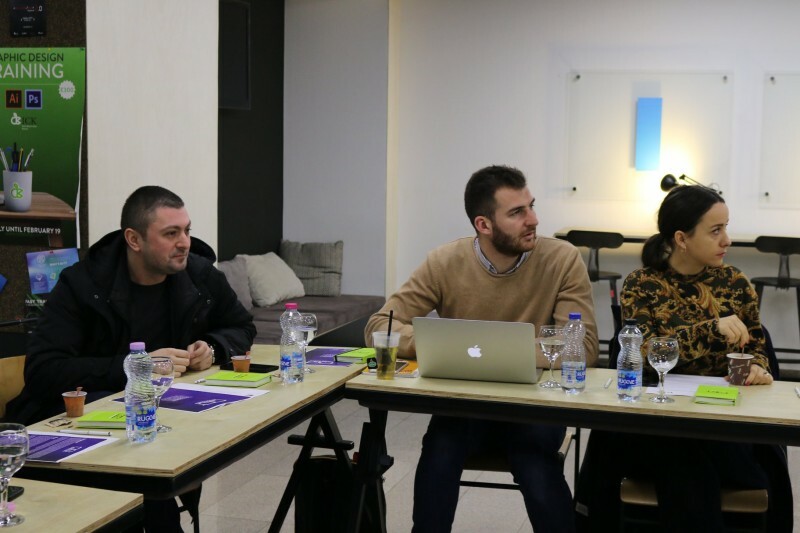 In an effort to give back to their community and hone their innovative tendencies, alumni Eldita Tarani, Shpend Lila, and Zana Tabaku implemented and represented a project all in thanks to the Alumni Engagement Innovation Fund after a 7-year dry spell on Kosovo’s part. And to expect a project so crucial for Kosovo’s youth to be the target goal of these esteemed individuals has left the Embassy in pride. The project is an organized course of lessons focused on a specific field as an extracurricular activity for those who are born with a passion for work but don’t what work they are passionate for. It is an awesome opportunity to pursue that which you always seemed to like on TV as a child but never seemed to have on hand due to the conditions of your district education. Not only will it help at least 90 kids locate their deep-seated dream, but it will also help them discover it and actually see it as a prospect for a future much-needed career. Educating and scouting go hand in hand, at least in this culture. Even when the project is over in the approximated number of six months, much like the iconic Queen single, the platform will go on. The current target cities are Prishtina, Peja and Mitrovica with the hopes of a successful ration to spread in other places as well. Panelist member and program co-curator Eldita Tarani remarked that “Once we can establish success in one area, the rest of it will catch on fire like a trail of gunpowder. If we succeed, we will rid the education system of dependency. As I’ve learned in life and academics, one can always seek salvation in the arms of knowledge when they learn to accept their lacking of it and welcome a horizon of it, regardless from which field it approaches”. The aforementioned fields in which the children will apply to and even go on a boot-camp formatted event with a competition and prizes for best innovative drive are as follows: Cybersecurity, entrepreneurial business skills, social media, robotics, coding and algorithm, pitch and presentation (crucial to sell a product), multimedia, artificial intelligence, gaming development, research methodology, marketing and into to blockchain. If any of the high schoolers who have applied choose a career path in the ICT field, it will be a tremendous success for the project. For it is paramount for these kids to show their true spirit as they are amazing minds in incredibly crippling conditions. It is difficult (although not impossible) feat, trying to abolish the local stigma of technological fields of study and use those skills as a building block in strengthening Kosovo’s core. Junior Geeks offers them a choice, to dig their own path instead of relying on external forces to guide their young minds to their future. Other team member and ICK Representative Shpend Lila pointed out saying “By waiting for the optimum opportunity to go with a prestigious donor being the U.S. Department of State, it’ll create a clearer ripple of networking for the rising young stars. For this thing we are creating together is not to reap benefits. Rather, it is community-based. To give to each other selflessly and see future results as a reward for our efforts. Besides, simplifying knowledge to make it fun is the most graceful form of education, and we’re here to deliver the fun”. A good point exposing the fine line between options and pressuring for kids was brought up by Cyber Security charge Drinor Selmanaj who pointed out that because the kids are bombarded with a vast selection of courses, they have more to choose from so they can pinpoint their exact talent and passion and channel their efforts there. Many individuals are discouraged from their dreams because they’re too young to make choices” adds third panel member Zana Tabaku, “but we tend to forget that once you grow up, you’re too old to dream. So we say that our tools are the subjects we tackle to make our dreams from something wonderful and far to reach into something tangible and real. We make of our dreams what reality alone cannot do on its own accord. That is the principle of our mission”. If you do not know what your dream is but are talented in inventing, invent your own dream, untarnished by words of degradation. Embrace the dork within, and dorky opportunities you shall find. 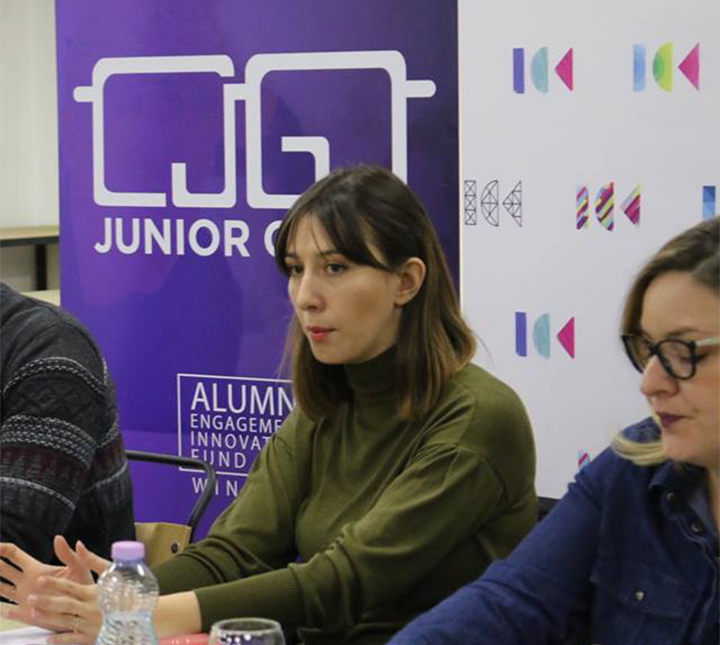 The “Junior Geeks” program is awarded to Kosovo US Alumni Ms. Eldita Tarani, Mr. Shpend Lila & Ms. Zana Tabaku, by the US Department of State’s Alumni Engagement Innovation Fund 2018. 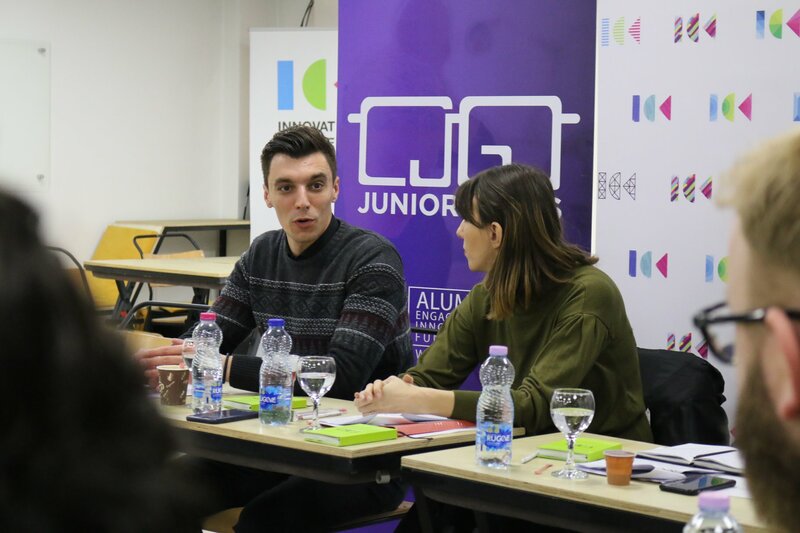 “Junior Geeks” concept was established by the Innovation Centre Kosovo, in 2015. Author: Dora Tarani (Innovation Centre Kosovo).